Julie Daniels has worked with dogs her whole life. She learned to walk by holding on to a German Shepherd. Today she is one of the foremost names in the sport of dog agility in the United States. She was one of the early champions of the sport and helped many clubs throughout the country get up and running. In 2015 Julie moved to Deerfield, NH, where she operates Kool Kids Agility. The property is easily accessible from the seacoast and from the Manchester/Concord area. The training area boasts a fenced FUNdamentals ring with first-rate downscaled equipment. There is also a large open dressage arena with excellent running surface and regulation equipment for the advanced classes. An extra building is fully finished and outfitted for training the human half of the agility team as well. Classes and personal training by Karen Kay CSCS are available year-round to all Kool Kids students. Julie also owns White Mountain Agility, a 90-acre dog heaven in North Sandwich, NH. That school has operated since 1993, and Julie developed many theme Camps there, including Wild Child, Speed-Em-Up, Novice Genius, and the world-renowned WMA Instructor Certification Course, which has honed the skills of hundreds of teachers and thousands of dogs worldwide. Julie Daniels is well known as a premier teacher at all levels of play, and she loves all kinds of dogs. She has competed, titled and won with all sorts of dogs through the years, including two Rottweilers, a Springer Spaniel, a Cairn Terrier, two Corgis, and four Border Collies. She is the only person to make USDAA National Grand Prix finals with a Rottie or a Springer, and she did it two times each. In IFCS international competition, Julie is a member of two gold-medal-winning teams. She is a two-time USDAA National Champion as well. She has won many televised events, including the Purina Incredible Dog Challenge and the ESPN Great Outdoor Games. Three of her Border Collies, Spring, Clark, and Sport, have made the Challenger’s Round at AKC National Championships. 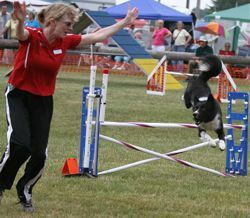 Julie and Spring are the only team to win the International Class three years in a row at Springfield, the largest agility trial in the United States. Julie and Spring also made an appearance to promote agility on Good Morning America. who started off “slow and thoughtful.” Now he pumps himself up to run and shoots off the line like the champion he can be. Motivation is everything! Julie also has a young Border Collie named Koolaid, who is a tiny powerhouse very eager to have her turn in the ring. Koolaid has two best friends: a mixed breed named Comet, and the family cat named Chime. 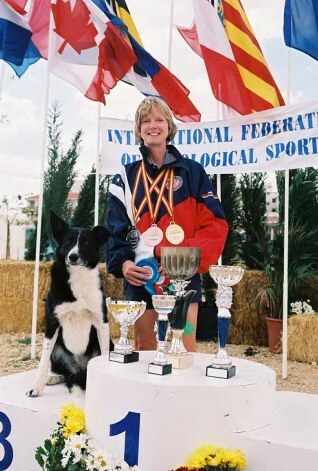 Worldwide, Julie is well known as the expert commentary voice of Cynosport agility. For many years she has done the livestream video broadcasts seen all around the world from these international events. Kool Kids Agility has a reputation for expert training using fun and games. Julie is an expert in the art and science of operant training, and her approach works! She has always taught “dog’s choice” games as a way to develop agility partnerships. Her first agility book was published in 1991 and the “dog’s choice” games were actually controversial at that time! But she was nominated for a Dog Writer’s Award nonetheless and has never waivered in her philosophy. Julie has a degree in English and loves to write as well as teach. She is the author of three DVDs and four agility books, including an update of her award-winning foundation training book, Enjoying Dog Agility. Julie also uses her writing talents extensively in her online classes. She coaches her in-person students online while traveling, and she teaches 6-week courses online for the Fenzi Dog Sports Academy (.com). She now plans to expand her writing to blogging. This Kool Kids Agility website will host one blog about living with cancer and another about young Koolaid and her best friends Comet and Chime.